Just a few days after Rahul Gandhi, leader of the Congress Party, announced the intention of implementing a “nationwide minimum income for the poor”, Prime Minister Narenda Modi’s government now proposes a “basic income for poor farmers”. This policy was set as a part of a supposedly interim budget, only up to the elections date (May 2019), although in this case expenditure was scheduled up to December 1st 2019, in a clear bet to win these elections and continue in power. The cited interim budget was presented by (acting) finance minister Piyush Goyal, and the “basic income for poor farmers” is expected to affect millions of small farmers, who will be paid 6000 Rupees per year (84 US$/year), in principle as an unconditional cash transfer. 6000 Rupees averages around 3% of a typical family yearly net living wage (~183000 Rupees), and 6% that of a single adult (96900 Rupees). It is inferred that the hand-out to farmers would be to the farmer, as the owner of the land parcel, hence to his/her family. In this context, the policy promise is not individual (only if the farmer is single and has no dependent children), nor enough to cover minimum necessities (not basic), nor universal (only for farmers). 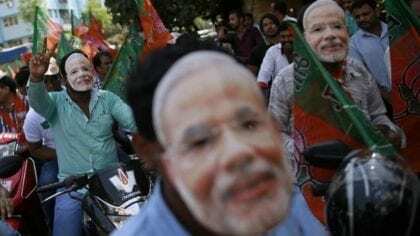 The “basic income” term, therefore, is used by Modi’s government in a very loose manner, which might indicate more of an intent to get an electoral edge, particularly over the latest Congress proposal. There is a general acceptance in India that transferring money directly to poor people avoids the corruption of the current subsidies system, and so such a policy as a kind of basic income makes sense to many. Unemployment is another important issue, but, interestingly enough, this might be ameliorated by the implementation of a basic income (type of policy), according to Gareth Price, from the Chatham House think tank. This is because direct, unconditional money in the pockets of people will most likely drive an economic expansion. Despite this reasoning, in other allegedly developed nations, such as France, the ability to work in paid jobs is still seen as central to the social contract. There, policy makers are more afraid people will just sit back and give up on contributing with their work to society, than they are confident that basic income will help those at the bottom of the income scale to fully participate in the economy, as workers and consumers.